Learn barbering techniques with these online barber tutorials on MHD. Situated at Hotel New York, Rotterdam, New York Barbershop is a traditional men's only barbershop for the real gentleman. Established in Rotterdam in 1884, New York Barbershop has been a family business ever since. A team of very experienced barbers offer the best service you can get. Besides a perfect haircut, clients can also have a luxury straight razor wet shave or a classic beard and moustache treatment. 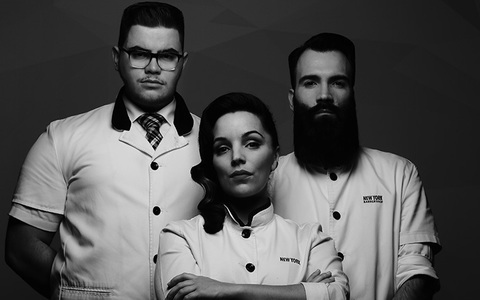 The members of the New York Barbershop team for our exclusive series of videos include Ivan Rodrigeuz, Erika Vera and at 18 our youngest ever contributor, Jason Verhaeghe. Ivan Rodriguez of New York Barbershop demonstrates a men’s cut with a razor parting. This barbering tutorial features pointers on clippers-over-comb techniques and guards, blending, thinning and the placement and detail of line. Erika Vera of New York Barbershop demonstrates a barbering technique to create a tapered beard and handlebar moustache. The tutorial covers essential information about clipper position, clipper size and guards and freehand techniques. Erika Vera of New York Barbershop demonstrates a traditional partial beard with clippers, clipper fade and razor. The video covers topics such as health and safety, dexterity, body and clipper position and contouring. Erika Vera of The New York Barbershop’s barbering tutorial demonstrates a full beard outline and features pointers on perimeter outlines, clipper guard attachments, forehand and backhand techniques and product application. Erika Vera of New York Barbershop demonstrates a classic shaving service with vital pointers on skin preparation, body position, blade angle and direction, first and second passes and outlines.